Sewing is often viewed as a humble art, done by women in their spare time – a grandma pastime. But if we take a moment to consider the three basic human requirements – food, clothing, shelter – then the highest esteem should be bestowed on the sewer. And we aren’t talking of the handful blockbuster designers but those like Bhavari Devi Lilar who supply to the many as opposed to a few. Smt. Bhavari Devi Lilar smiles at us encouragingly as we cautiously approach her stall at the Crafts Museum, New Delhi where she sits and works on an indi, a round cloth padding used to balance pots placed on the head. Nearby, her son Madan Lal Lilar sits and occasionally joins in the conversation. Bhavari Devi is from the Bhanwata-Kuchamancity village in Rajasthan. There, things like the indi and the kansari – a type of blouse typically worn only by Rajasthani women – are used everyday. There are 1100 households in this village, and most of them rely on agriculture and animal husbandry for a living. Most of the people are Hindu’s, but there are also Muslims and a few Christians. People generally marry within the same caste, but rarely from the same village. Bhavari Devi’s family kept cattle and as a child it was her responsibility to look after her family’s animals, but she sewed in her spare time. She started with only a basic knowledge of sewing, but gradually, she taught herself more elaborate garments and designs. She soon progressed to wall hangings and dolls. No one instructed her, her designs were her own. She was the only one in the family to do it. When she grew up, Bhavari Devi became a manual laborer in Delhi, working on roads and construction, like many others from her village. During that time, she met Sulender Patel, who organised fairs nearby. Seeing her work with cloth, he invited her to join the fair, and supported her during her shaky start. He encouraged her to continue, and she soon left off breaking rocks all together. He lives in Allahabad, where he runs fairs and hotels. Bhavari Devi still speaks of him fondly, because, in a way he ‘saved’ her. But it was when she went to a fair in Sorskond when she actually started to branch out and develop her skills. While a lot of households in her village made their own indis and clothes which were simple and functional, her work became more elaborate, and detailed. She also makes other things like strings of parrots, jewelry and fans. When her husband died, her son left his office job to join her. Her daughter-in-law still does this in Rajasthan, while her other son works elsewhere. 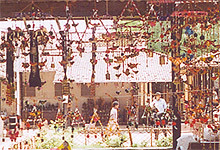 Bhavari Devi’s wares have changed through the years to keep up with changing trends. However, they also cater to the needs of her customers in her village, where her family runs a shop. Most popular in Delhi are the strings of parrots, which are usually given to babies. Embroidered fans are also popular. Besides these, she and her son sell indis, kansaris (blouse) and ghagras (gathered skirt). One indi could take from one and a half hours to a day to make, depending on the intricacy of the work. A kansari would take one day, while a ghagra could take from 2 to 4 days to a week. She also sells earrings and bracelets, which she often buys and then sells. Lately, she explains, gold has become more popular. Even then, the pieces she buys to sell are usually traditional, like Rajasthani headpieces and earrings. She takes orders for fans and clothes. Most of the material is cheap, which is why the finished products don’t cost much. Most of her materials- cotton, wool and other types of cloth- she gets from markets in villages around Rajasthan, or in Ajmer and Jaipur. Bhavari Devi is famous for her work. She has been invited to fairs all around Rajasthan, Agra, Bangalore, Hyderabad, Sikkim and Odisha. She has been back to Sorskond approximately18 times. All in all, she goes to about six to seven fairs a year. She has won several awards, including the Kala Shri Award. Inspite of her prestige, her family gets hardly any government support. 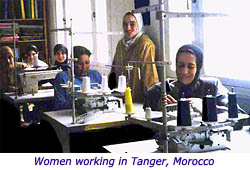 The Crafts Museum provides them with food and lodging and money for transport. Beyond this, though, the future is uncertain. They can be sure of several invitations over the next few months, but hardly any people come to the village shop.